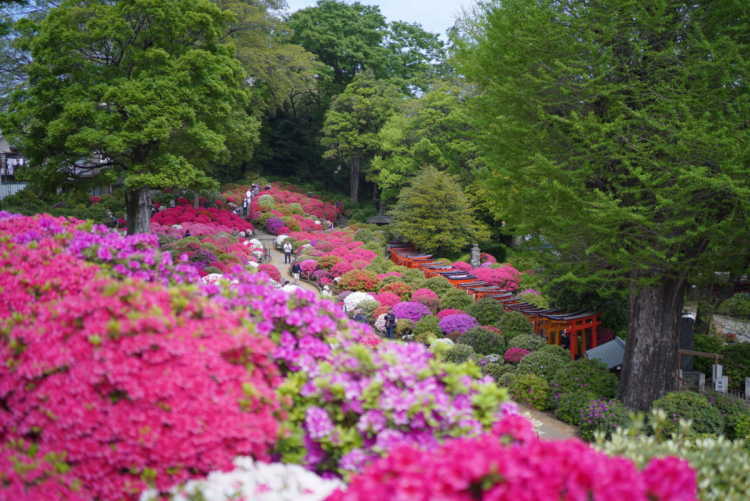 Nezu Shrine is celebrated as a spiritual power spot in Tokyo, and 6612 square meters Azalea Garden has been its best. The scenery of Senbon Torii (one thousand torii gates standing in a line) located at the both sides of Otome Inari Shrine in the precinct is one of the best things to see here. Azalea Festival is holding till May 6th.◎Opening hours: 9:00-17:30. Entrance fee: 200yen. Access: 5 min walk from Sendagi Station 1st Gate. I entered from North Torii Gate, and went through Senbon Torii, and arrived Azalea Garden. When I left the shrine, Senbon Torii was crowded with many people. As you expect, the early morning is better. Please check HP to find other ways to visit Azalea Garden. You can look the blooming conditions by live camera. I think it's good for you to visit sooner.